Super fluffy and creamy JUST 4-INGREDIENT Dutch Cream Waffles! The master bedroom makeover saga continues. We spent the better part of our Saturday purchasing, transporting, and assembling the new dressers yesterday. After 10 stores (and plenty of web surfing) Ikea came through for us. Again. We should get more Swedish stores. They have an organizing solution for everything at steal-of-a-deal prices with magical powers to turn sloppy clothes-under-the-bed people like me in to neat-freaks. Plus they serve giant cinnamon rolls. But, my earlier statement, it needs revision. When I say we assembled dressers, I mean that we assembled dresseR. One of four. And when I say we, I mean my husband did most of the assembling and I did the really important things like interpret the hieroglyphics in the instruction pamphlet and make cherry vanilla diet coke runs. Somebody’s gotta do the dirty work. The one dresser took more than 3 hours from start to finish and we still haven’t applied a top coat so I’m thinking we should have these babies finished, filled, and in the bedroom by, oh….. November? We didn’t only work on dressers yesterday though, I also painted our ceiling fan. Yes, painted. Spray painted actually. It was a cherry grained wood and though I’ve never loved it, it was especially clashing with our room now that it’s re-painted and somewhat furnished. So we removed the blades and I froze my britches off in the garage to spray them a gorgeous shade of gray called…. actually I can’t remember. something Castle I think. I was so excited with the finished product that I got a little bit ahead of myself and started reassembling the fan only to realize I was leaving finger prints all over the not-quite-dry paint. A bit of touch-up work is needed but in they end the fan will be gorg and I will be one happy girl. In other news…. My life has been made a bit sweeter, a bit easier, and a lot more delicious by the discovery of dutch cream waffles. These waffles happened because after we got back from our Christmas-gift-cruise (thank you Santa) my husband’s birthday was the next day and I made a big deal of promising days in advance that I would make him waffles for breakfast on his birthday. 7:00 am: wait, what do you mean we don’t have any milk?? After a miniature panic session, a quick google search informed me that there is a type of waffle called a Dutch Cream Waffle which only requires 4 ingredients. One, two, three, four. 4. And can be made with heavy whipping cream – which oddly enough, I had even though I was out of any regular milk. Turns out these dutch cream waffles are the answer to my quest for the perfect waffle recipe. 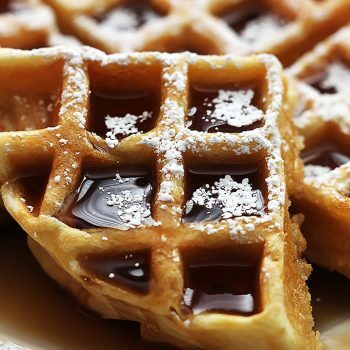 For the past couple of years I’ve been trying to find out what makes the difference between light and airy waffles and denser, thick waffles. 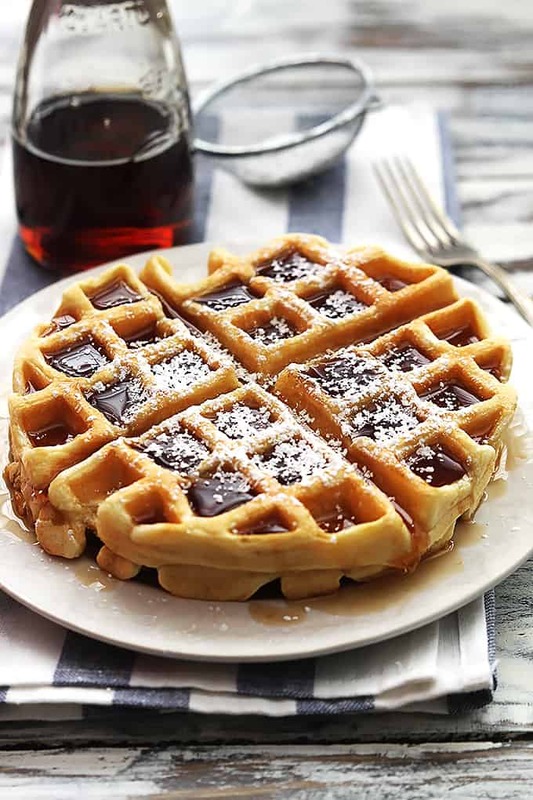 I like my waffles semi-dense because when they are too airy, the syrup all soaks up into the waffle and that’s just, ah, so wrong. 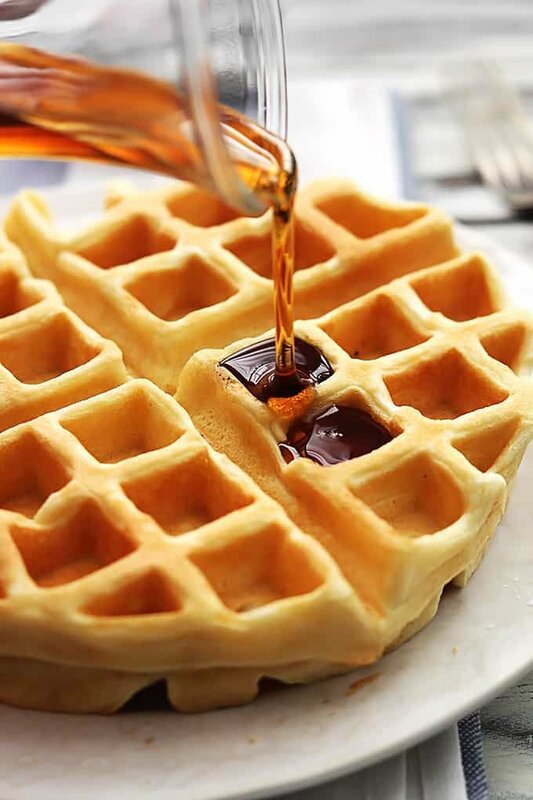 When the waffle soaks up the syrup I just find myself using 4 times the amount of syrup, usually dipping each bite into a bowl of it just to make sure I can actually taste and feel the syrup on my tongue. Ridiculous. 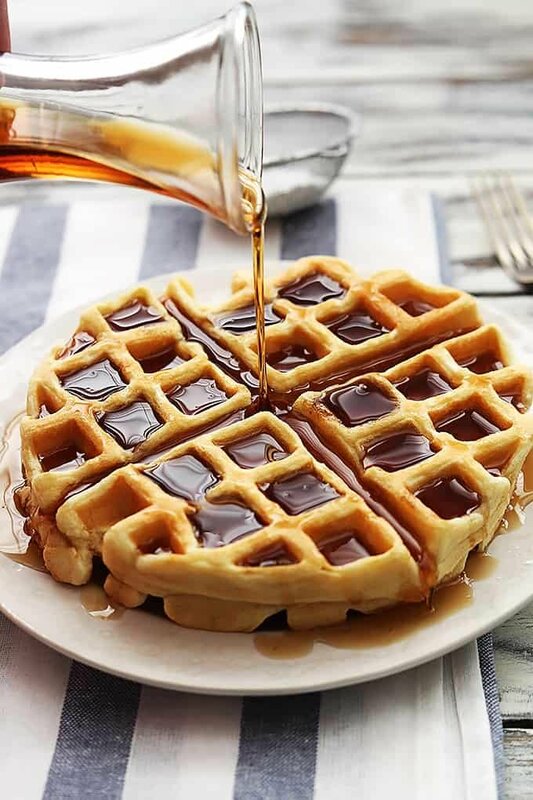 The syrup needs to sit on top, fill every square and then just float there ready to be devoured in each and every waffle bite. And these waffles, they deliver. Oh baby do they deliver. No soggy waffle sponges in this house! 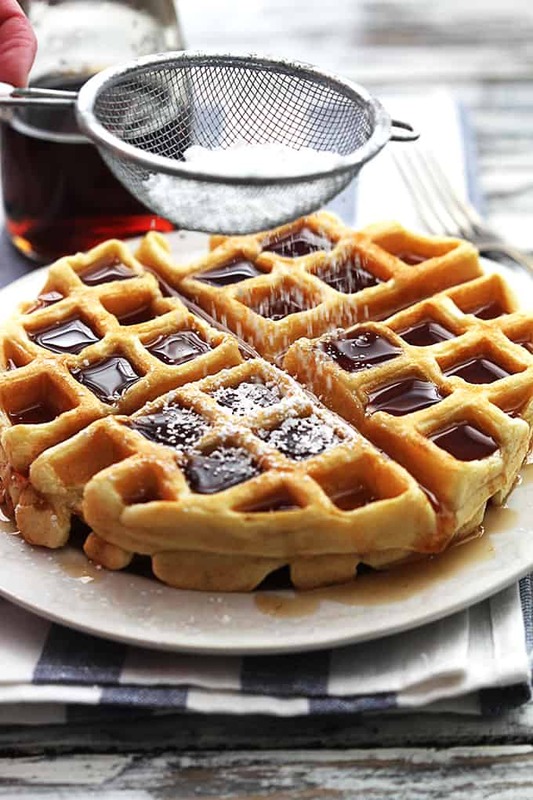 Super fluffy and rich dutch cream waffles - JUST 4 INGREDIENTS! In a large bowl, combine flour and salt. In a small bowl, beat egg yolks on low speed. Gradually pour in cream and beat for 1 minute. Add wet ingredients to flour mixture and mix until smooth. In another bowl (make sure your beaters are clean) beat egg whites on high until stiff peaks form. Gently fold into batter. Bake in a preheated waffle iron according to manufacturer's directions. Serve warm with desired toppings. 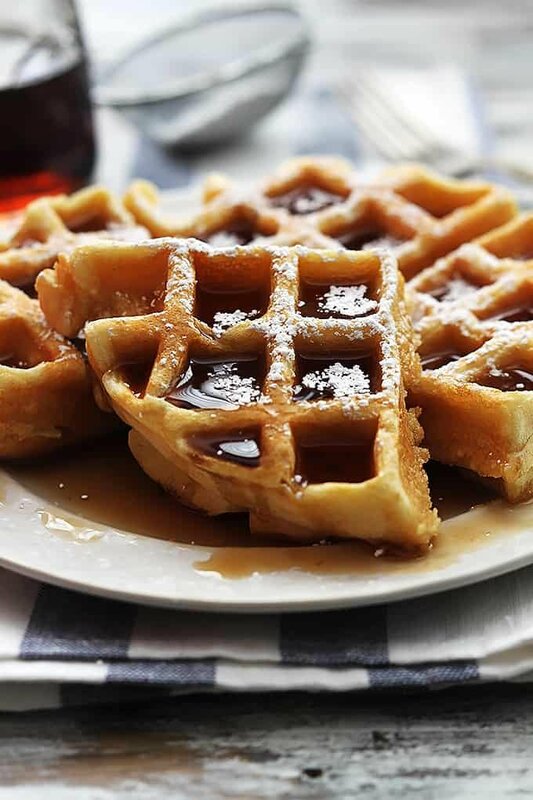 *I love to add 1 teaspoon vanilla and 1/2 teaspoon ground cinnamon to the waffle batter for a fun flavor variation. Try it! More Breakfast Recipes you'll enjoy! It’s so true, my basement is COVERED in ikea furniture boxes and holy moly they each have a lot of pieces! Good thing everything is so cute and affordable or I’d be in big trouble!! My boyfriend and I got Ikea dressers in our new place and it took forever and a day to construct them. My thoughts go out to you two. That being said, pleaseee can I come over and eat these waffles in exchange for free labor? They’re amazing!! My absolute fav. This is a great recipe for when I don’t have enough cream to make a batch of ice cream, but I need to use up the cream fast before it expires! Exactly! 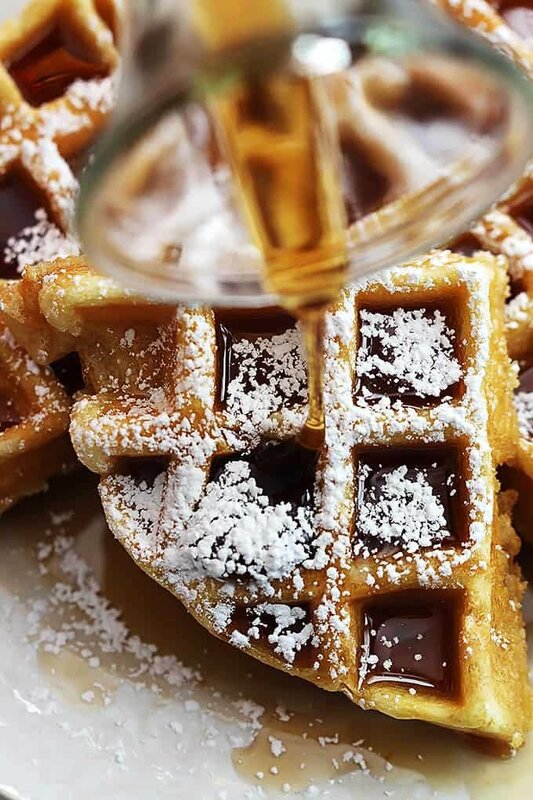 And how can you ever turn down a batch of fluffy waffles right?? 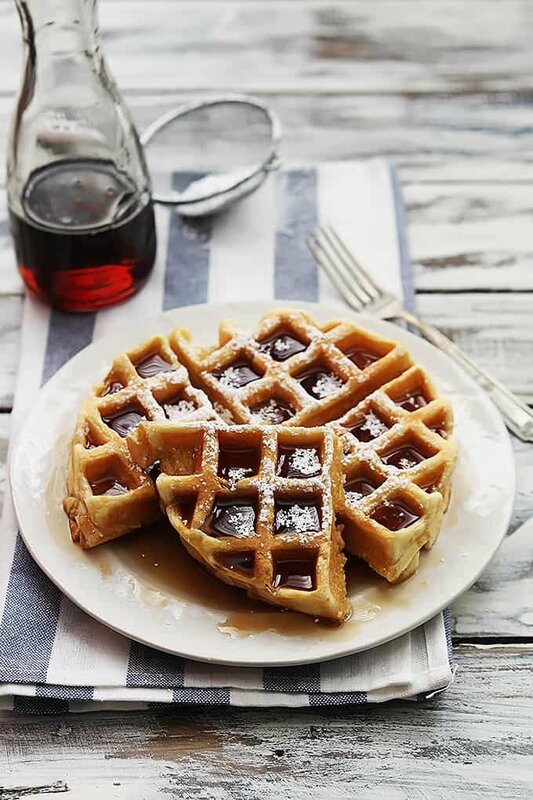 We tried these waffles for brinner this week and my kids and I loved them! We enjoyed them so much we made them again for our weekend breakfast. I shared this on my blog today. Thanks for a great recipe! Absolutely delicious! This is the waffle recipe that I’ve been searching for. It’s probably a bit more expensive then your average waffle recipe because of all the heavy cream at least here it’s not cheap and it takes a little more time to. But it is totally worth it! I added vanilla and doubled the recipe because I have four to feed but there is plenty left over so I’m going to see how they freeze. Thank you so much I will never make another waffle recipe! How do you think half and half would work in these in place of the heavy cream? I always have it on hand and rarely use it all before it expires! Hi Hannah! I’m not sure because heavy cream is so much thicker than half and half (which I love to cook and bake with!) but if you give it a try I would LOVE to hear how it comes out! do you use all purpose or self rising flour? 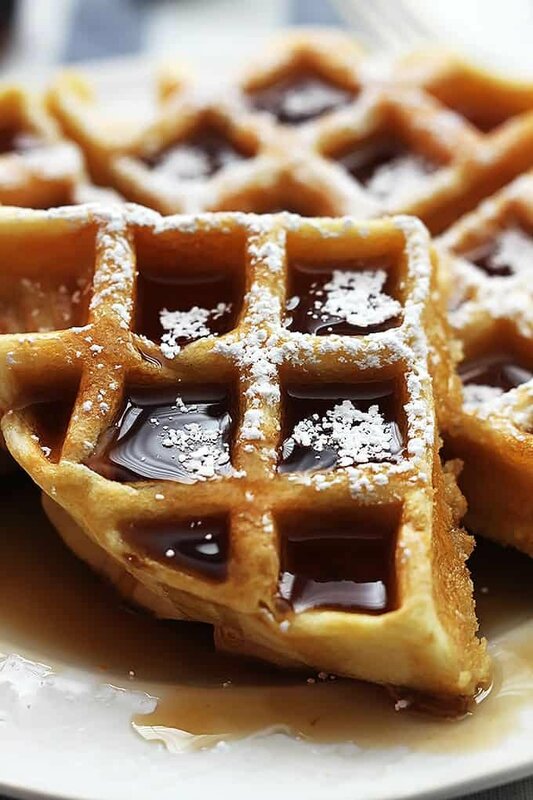 Hey there – just FYI the pics and recipe you posted is for Belgian waffles. Dutch are called stroopwafels and are completely different. These waffles are delicious! I used vanilla in the mix and added blueberries when making them. I also topped them with fresh whipped cream. Okay, I am impressed. They are coming out perfect. I dunked the first one in butter that was sitting on the counter, which turned out to be garlic butter, and it was spectacular. The second one got maple syrup, the real thing, and it sits on top of the waffle. Great recipe! Leonard- you had me at REAL maple syrup!! Happy to hear they were enjoyed, even in the garlic butter!